Tagged with "Eileen Fischer Donations"
“Shopping locally is an effective way to keep the economy alive,” says author and NEF researcher David Boyle. Indeed, says Boyle, many local economies are languishing not because too little cash comes in, but as a result of what happens to that money. "Money is like blood. It needs to keep moving around to keep the economy going," he says, noting that when money is spent elsewhere—at big supermarkets, non-locally owned utilities and other services such as on-line retailers—"it flows out, like a wound." When you commit to buying a percentage of your goods locally your money changes hand 9 times strengthening and revitalizing your community. Shop Local and Eileen Fisher have paired up in celebration of Earth month to promote GREEN EILEEN, a recycled clothing initiative that is committed to reducing environmental impact by extending the life of timeless garments. Eileen Fisher is promoting her GREEN EILEEN initiative in accordance with the Shop Local movement to promote and stimulate local economy. Details will be hosting a Shop Local event by accepting donations of your gently worn Eileen Fisher clothing in store from April 24-26. 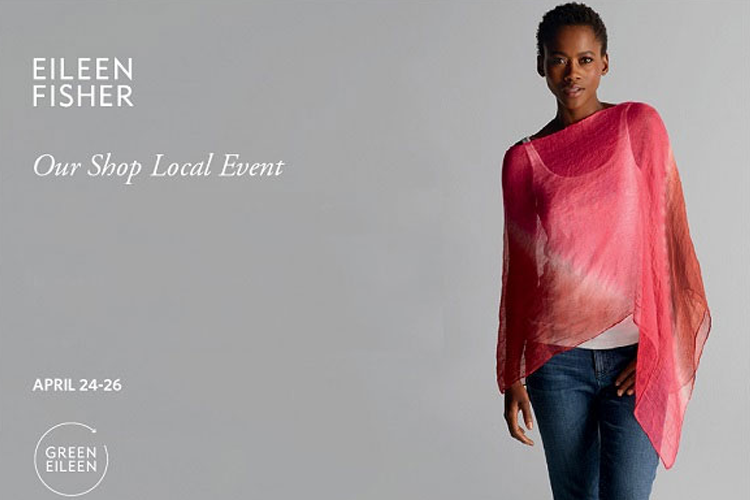 Customers will receive a 5$ certificate for every item donated that can be spent towards new Eileen Fisher merchandise in the store during the Shop Local promotion! We have tons of light and fresh Eileen Fisher adding pops of color to our racks just in time for spring cleaning… so clean out your closets, move your parkas into storage, and make room for Eileen! All Eileen Fisher donations are shipped to a GREEN EILEEN recycling center where clothing is professionally cleaned and re-sold at one of 2 GREEN EILEEN locations at affordable prices. All profits support programs that improve the lives of women and girls in our local and global communities. Participate in our shop local event by visiting us on Water Street between April 24-26 to shop for a cause, stimulate local economy and go GREEN with EILEEN!